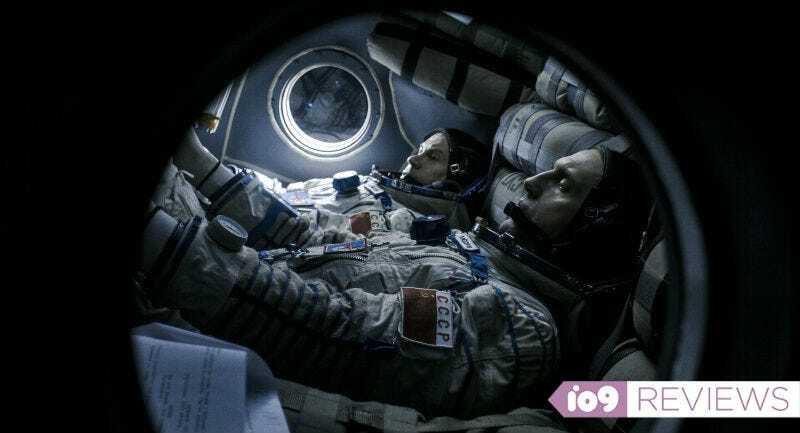 A team of astronauts is specially trained to solve an unprecedented disaster in space. It sounds like the plot of Armageddon or any number of other generic Hollywood blockbusters, but in the Russian space adventure Salyut-7, it actually happened. Unfortunately, somehow that doesn’t make the movie any more exciting. In 1985, two Russian cosmonauts went into space to attempt to repair the Salyut-7 space station, which had been damaged and was in danger of randomly falling on Earth somewhere. This new film by Klim Shipenko dramatizes that mission to great effect, making a rousing, entertaining, big-budget piece of cinema. Unfortunately, it also feels as vanilla and predictable as any “people in space in trouble” movie you’ve ever seen. At no point during Salyut-7 does the film ever feel like something new. Certainly, the tried and true tropes of blockbuster filmmaking are tried and true for a reason; we enjoy slightly exaggerated character development, spaceships launching while a rousing score plays, and the triumph of heroes over adversity. It all works in Salyut-7, but none of it stands out, turning what should be an incredible true story into a by-the-numbers blockbuster. It conforms so tightly to the archetype that it doesn’t feel true. The one place Salyut-7 does kind of stand apart is with its special effects. Though they aren’t as abundant as in Alfonso Cuaron’s Gravity, they can be just as gorgeous, if not moreso. There are incredible zero-gravity sequences throughout, stunning POV shots outside the space station, and sequences filled with seemingly impossible camera movement. Shipenko knows what he’s doing when it comes to these kind of effects and how to meld them with the story. And, on occasion, the film’s beauty made me forget I was watching a movie. But after that, it was right back to it—right back to the standard third act twist, with a last-minute problem that seems to spell certain doom, only to be solved by even later-minute heroism. Hollywood makes movies like Salyut-7 because they’re a proven commodity. This is the kind of easy-to-digest popcorn executives think audiences want and they’re usually right. But since Salyut-7 wasn’t made in Hollywood, I was hoping for something more. It’s a Russian production about a true act of national heroism, but instead of being a uniquely Russian film, it’s really just a prime example of how far Hollywood’s mentality has spread. I was really hoping something in Salyut-7 would make it feel memorable. But, outside of the language the characters speak and patches on their uniforms, even the Communist setting fails to register. What’s left is a perfectly fine example of big-budget entertainment and not much more.